The CAD Premium 7-Piece Drum Mic Pack gives you extended frequency response, superior sensitivity, and faster transient response to give your performance the nuanced, powerful amplified reproduction you want. 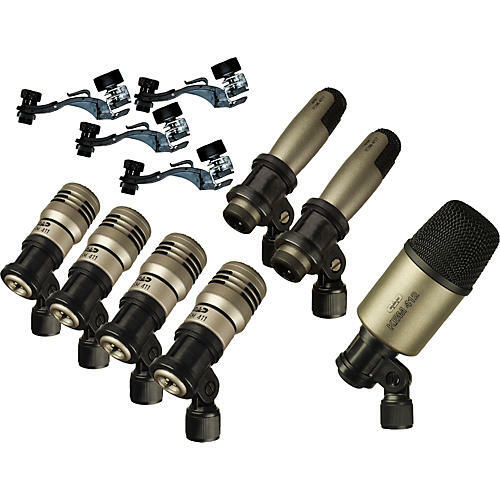 The CAD 7-Piece Drum Mic Pack includes one KBM412, 4 TSM411 mics, 2 ICM417 mics, and 4 DMC-1 mic clips. The KBM412 is a rugged kick mic with powerfully accurate low-end reproduction. The TSM411 neodymium dynamic mic is an excellent and versatile percussion mic that excels for use with toms, snares, cymbals, and congas. With the ICM417 electret condenser mic, you get natural, transparent sound for rich amplification of cymbals and effect percussion. The mic clips offer secure, easy mounting for your mics with effective isolation, adjustable height, and strain relief.